In 2014, the Chevrolet Corvette Stingray triumphantly returned as a paragon of American performance vehicles. The design of this vehicle has a storied past, but even enthusiasts might be surprised at some of the twists within the narrative. The clean lines of the new Chevrolet Corvette Stingray belie its complex origins. The name “Stingray,” or “Sting Ray” as it was written in 1963, evokes an immediate connection to predatory fish of the ocean. 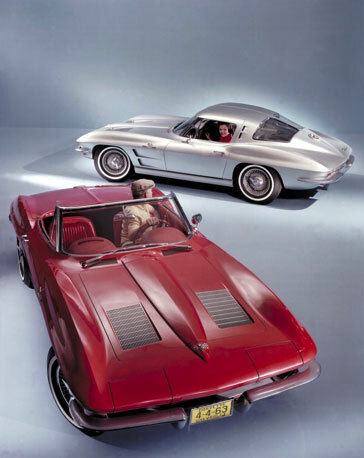 Indeed, two concept Corvettes shared the namesake of a Mako Shark caught by Bill Mitchell, Vice President of Design at General Motors, (1958-1977). In 1957, Mitchell gave some initial instruction to his team that included a challenge to create a car that was, “a complete breakaway from what we've seen around here in the past.” The resulting concept sketches depicted vehicles that departed from the rounded forms of the 1940s and 50s. The team of designers in Mitchell's “Research Studio B” included Bob Veryzer, Chuck Pohlman, Norm Neumann and nineteen-year-old Peter Brock, a young designer in 1957. Brock answered the challenge with a sketch that was selected by Bill Mitchell for further development. The design foreshadowed many of the trademark elements of the 1963 Sting Ray. The direct inspiration taken from Brock's sketch, however, would be seen in the 1959 Stingray Racer XP-87. Larry Shinoda would create the final design of the XP-87, and in turn, the 1963 Corvette Sting Ray. By 1964 the ‘split rear window’ had been dispensed with, but in large part the famous design created by Mitchell's team lived on until 1967. Their success and the progeny of the second generation Corvettes would solidify the model's place in American automotive history. For more information, check out Peter Brock's newly published book, Corvette Sting Ray: Genesis of an American Icon.